In English North American culture there is a long tradition of ‘educational hero’ films that show the power that one great teacher can make in the lives of many. In Dead Poets Society, Robin Williams’ individualism saves the boys from becoming shallow men of industry, in Lean on Me, Morgan Freeman’s strict principal transforms the challenged school into a place where students look to the future. In Dangerous Minds Michelle Pfeiffer’s tough marine teacher goes against the odds and earns the respect of her ghetto students and makes them envision a greater future for themselves. By contrast in Mexico there is an absence of these kinds of films. What does this tell us about the value of education? In English North American culture we accept the premise that education will set you free of whatever circumstance you find yourself. De Panzazo a new documentary by Mexicanos Primero, a citizens organization dedicated to improving education reflects the reality of education in Mexico. The interviews with parents, principals, teachers, officials and union representatives draws a bleak picture of the current state of Mexican education. The three year project captured the dynamics of students in a diverse range of places such as Ciudad Juarez, the interior of Yucatan, Morelia, the mountains of Chiapas and Guerrero, as well as Naucalpan and Iztapalapa in the metropolitan area of Mexico City. 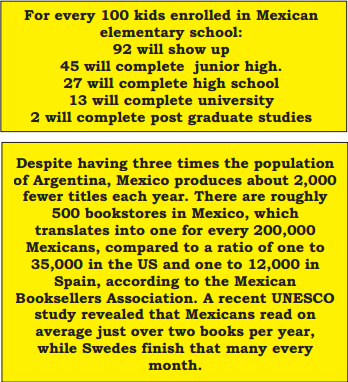 A major problem with education in Mexico is the lack of preparedness with which teachers begin their career. The teacher’s union in Mexico is controlled by Elba Esther Gordillo, the 67-year-old “president for life”. Gordillo enjoys a nominal salary as a school principal, the equivalent of $2,070 US a month, but her wealth goes far beyond what that wage would allow. She flaunts wealth and power, and she can walk through the gates of Los Pinos, the Mexican White House, at any time. If this were a fairy tale she would be riding a broomstick and wearing pointy shoes. In reality she is criticised for her Hermes purses, facelift and iron political fist when it comes to keeping the teacher’s union controlling education in Mexico. Teacher’s salaries are raised based on a points system. A teacher can accumulate points by attending workshops, political meetings, conferences and dinners- most of these translate into school days without teachers. Points are also handed out when teachers join in protest such as marches, ralleys or union meetings. The teaching style also focuses on learning by rote and repetition rather than an approach that focuses on critical thinking and problem solving. Despite its footage of broken desks, telesecundarias without electricity- let alone TV’s for distance learning and kids who can’t complete basic math problems., De Panzazo ends on a positive uplifting note encouraging students, teachers and parents to work together to make a difference. While it isn’t quite a Hollywood ending, the sad reality is that unless the teacher’s union and government truly commit to improving teachers training and infrastructure, improvement will be fiction.